Dilla n. signifying the state of being hooked on something, e.g. jeg har dilla – I’m hooked. 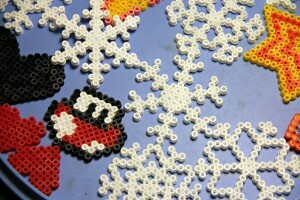 Specifically, I’m hooked on making snowflakes from beads. 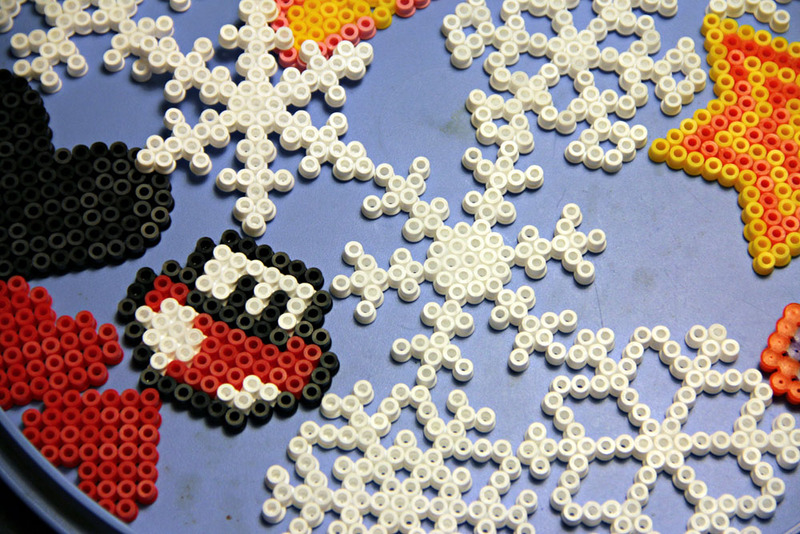 Since the lass also likes fiddling with the tiny beads, we can sit reasonably peacefully at the kitchen table and create together, which is nice. That black heart is hers, by the way. Yup, a three-going-on-four-year-old goth, obviously. skrivesperre, n. writer’s block (literally ‘writing block’). I’m sure it’s pretty obvious why I suddenly have that word on my mind. matpakke, n. literally ‘packet of food’. There is a tradition in Norway for the no-nonsense packed lunch which I love. Basically, whereas our neighbours the Swedes have hot lunches at school, Norwegian schoolchildren have a ‘matpakke’ from home that they unwrap and eat at lunch. And when I say no-nonsense I mean no-nonsense. No crisps. No chocolate. At a stretch some fruit, or more likely a carrot, but the main part is two (normally) pieces of bread with something nice and sensible like salami, pork liver pate or cheese (white or Norwegian brown goat’s cheese). The daring may stretch to a slice of pickled cucumber on the pate, or a sliver of red pepper on the cheese (the white). And we’re not really talking sandwich here, that’s a British concept. For convenience the pieces of bred might be turned to face each other for a sandwich effect, but more often than not pieces of grease-proof paper have been cleverly employed to keep the slices separate, allowing the inquisitive mind to have two different types of spread. Allemannsretten as a concept might not be unique, but it is actually law in Norway and as far as I know that is pretty much unique. The literal meaning of the word is ‘everyman’s right’ and that’s exactly what it is: It’s the legal right to make use of Norway’s nature (which is pretty wonderful, more on that later) – regardless of who owns the land. The law distinguishes between ‘innmark’ and ‘utmark’ (‘in land’ and ‘out land’), ‘innmark’ is land that is in domestic use, such as the farmyards, gardens, fields with crop, grazing meadows and so on, where the public would be a nuisance to the owner. This land is off-limits unless you have the owners permission. On the other hand, ‘utmark’ is where allemannsretten comes into play. That nice bit of beach that just happens to be on your land? Want to put up a ‘Private’ sign? Well, tough luck, you can put up the sign but it won’t do you any good. That nice meadow by the stream, perfect for camping? Well, anyone can camp there, as long as they treat the place with respect (i.e. don’t start forest fires and pick up their litter when they go). tømmermenn, n. literally ‘timber men’, i.e. lumberjacks, though it’s been a while since anyone actually thought of axes, saws and timber when they heard the word, I suspect. Nowadays, you have tømmermenn, and it basically means you have a hangover. hockeysveis n., the haircut popular in the 80ies – short on top, long at the back – I believe it’s a “mullet” in English. Literally “hockey haircut”, which seems harsh on hockey-players, but it’s amazing how many of them sported (and still sport) that particular style (a misnomer if ever there was one, what’s style got to do with it?). So, hands up: Who had “hockesveis” at some point? (I know I did, when I was trying to grow my hair long from it being very very short – I was 13). Skjør, adj. brittle, fragile or friable. Also – as you might expect – eccentric, mad, loony, off the rocker. Magen blir mett før øya, idiom, literally “the stomach gets full before the eyes” (øya is dialect for eyes, the norm would be øynene), meaning the tendency to fill your plate up with too much food when presented with something you like, forcing you to either eat yourself sick or to leave embarrassing heaps on your plate at the end of the meal. Sometimes used metaphorically, when a rough equivalent in English would be “bite off more than you can chew” (though we have that – literally – in Norwegian bite av mer enn du kan tygge). i pose og sekk, idiom, meaning literally “in bag and (knap)sack”, akin to the english “to have one’s cake and eat it”, but in addition to being used about something you want, about expecting too much, you can also use it about being given a little more than expected. An ad-man might say “Velger du denne bilen får du både i pose og sekk” (If you chose this car you get…), meaning that it’s got lots of extras or that it is multi-purpose, a car that looks like a sports car but has plenty of space in the boot and room for passengers, for example. How on earth did I get on to the subject of cars? I started a vague attempt at a blog in Norwegian, by the way. I realised that I write english almost exclusively at the moment, and I don’t think it’s a good thing. I’m supposed to be bilingual, you know. There are also a few subjects that I feel like blogging, but that would need too much explanation to make any sense to someone who doesn’t speak Norwegian to be worth the trouble. So, we’ll see. If you only “sort of” read Norwegian and want explanations for anything you don’t understand, give me a shout and I’ll see what I can do. Ok? Voice in my head: Pink – Don’t Let Me Get Me. God dag, mann. Økseskaft, idiom. The phrase comes from the folk tale about a man who is going deaf and who expects a visit. In order to hide the fact that he can’t hear a thing, he prepares answers to the questions he expects to be asked. As he is whittling the handle of an axe, he assumes the first question will be along the lines of “What is that?”, unfortunately the first thing said is actually “Good morning.” Hence today’s expression, which translates literally “Good Morning, man. Axe handle”, used to indicate a perceived communication problem whether intentional (such as politicians answering the question they would have liked to be asked rather than the one they were asked) or unintentional, a talking at cross purposes.